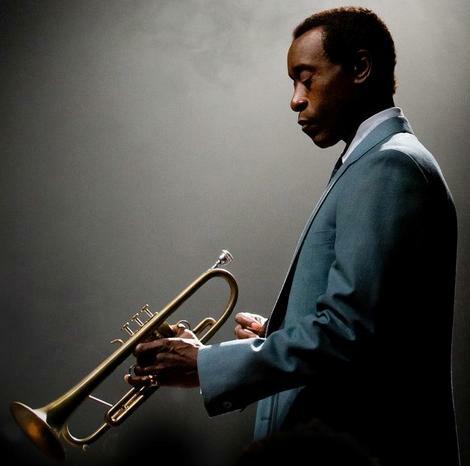 Miles Ahead -- not the tune composed by Davis and Gil Evans, but the film directed by Don Cheadle -- plays with this pair of queries, improvising on a segment of a jazz icon's life who sounded everlasting chords that played in bebop, cool jazz, third stream, modal jazz, post-bop and, ultimately, jazz fusion. Davis was born of affluent African-American parents in Alton, Illinois in 1926. His dad had a dental practice. For most of Davis' youth, home was East Saint Louis, Illinois. The family also had a ranch a bit south, near Pine Bluff, Arkansas. The fact that Miles Dewey Davis III allowed for such a significant amount of musical evolution while blowing his horn surely came from his talent, drive, need for attention and relentless narcissism. Fans of icons, whatever they're iconic at doing, seem always to be the most forgiving. The problem with jazz -- if you wish to call it a problem -- is that some of it is the best kind of music there is … and another kind of it may be the worst. When listening to him and recalling Miles Davis' extraordinary contribution to American music, a lover of jazz must confront this reality. And so is the case with Miles Ahead, the film. Cheadle is an extraordinary actor and director. He does jazz music's “Prince of Darkness” in the film … convincingly. Changes in Cheadle's appearance as Davis are helpful cues to what periods in the musician's life are being depicted. For anyone not well-versed on him, note that when Cheadle's hair is clipped short, that's early Miles. Longer, curlier hair is later Miles. The costumes Davis wore late in his career also signal when he was altering his music to more closely match other genres of the day. I've always sensed that Davis needed to make some kind of assault on the past. The word was and is that the trumpet genius was merely evolving, and felt evolution of his music was as important to it as all else. Most who are involved with or curious about jazz in some way agree, but then there's the concept that his later music didn't change as much as it was absorbed somewhat by more popular sonic vernaculars. The jazz I listened to and really liked -- and still do – is jazz that was ahead of .. not listening to what was current in venues where jazz wasn't performed or broadcast. I've always felt that Miles Davis needed to make some kind of assault on the past. The word was and is that the trumpeter was merely evolving and felt evolution of the music was as important to it as anything. As played, Miles Davis isn't one whom you can care about so much … even though you really dig the set he's just blown.